U.S. political magazine The Rolling Stone released disturbing pictures last week of American soldiers posing for photographs with dead Afghan children and innocent civilians that they deliberately murdered, and then covering up the murders by planting weapons on the dead bodies to give the impression that they were hostile combatants. These monstrous atrocities committed by American soldiers reveal the depth of immorality regarding Western wars, and worse still the psychopathic mindset of many soldiers. 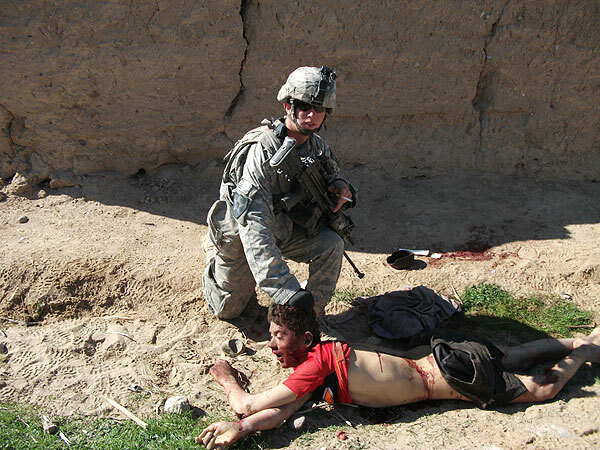 The pictures reveal that on January 15, 2010, U.S. soldiers in Bravo Company stationed near Kandahar, murdered Gul Mudin, an Afghan boy of around 15 years of age. Cpl. Jeremy Morlock and Pfc. Andrew Holmes ordered Gul to stand still, threw a grenade at him and opened fire. They then proceeded to cover up the crime scene to make it look as if they came under hostile fire. Holmes kept the boys finger and kept it in a bag to remind him of his first Afghan kill. This is the mindset of many of the soldiers the Western media is portraying as brave and defenders of democracy overseas. Cpl. Jeremy Morlock has a history of drug abuse and physical abuse against his wife but was still allowed to become a US soldier. The army covered up these pictures which could indicate a far greater problem than they are willing to admit. According to Malalai Joyal, an Afghan politician and a former elected member of the Parliament from Farah province, in an article for the Guardian (Kill teams in Afghanistan: the truth: Wednesday, 30 March, 2011) these murders are akin to racism which defines the occupation of her country. Joyal mentions another crime committed by US and Nato forces when nine children were killed in Kunar Province while they were collecting firewood. She mentions how 65 innocent villagers, mostly women and children were killed by Nato forces. Nato claimed that they were hostile combatants, but suspiciously arrested two al-Jazeera journalists who came to visit the massacre site. Joyal speaks of how Afghan families have been offered money to keep the murders under wraps. It points to a larger issue largely ignored by the mainstream media, that these wars are fought in largely non-European countries and the victims of these wars are mostly non-Europeans. These wars are also fought for resources such as oil and gas etc., making them no different to the colonial conquests and atrocities carried out decades ago in the name of a Western empire. Today, the conflicts remain the same but the ideology has changed. Instead of the mission to civilise the darker nations the West claims to be bringing democracy or humanitarian intervention as in the present case of Libya. Instead of the Ku Klux Klan going around hanging black men and killing non whites, we now have soldiers to carry out these atrocities legitimately. Perhaps if the white citizens of these countries were aware of what atrocities have been committed overseas by soldiers they would understand why Muslims march against soldiers, referring to them as butchers. If an African, Indian or Asian army had committed similar atrocities against white children and innocent civilians the cries for revenge by the Western media and indeed the public would be deafening. The Western media would probably be sympathetic to armed citizen groups taking revenge against such atrocities. As it stands, it is not white children being killed, or white civilians, and the outraged Muslim community who decides to take revenge are called terrorists. To even voice their opposition to these wars arouses suspicion. Go two hundred years back in history when slavery was legal and mass murders of non whites was seen as normal and the frightening truth seems to indicate that not much has changed. So Joyal is right, the barbaric treatment of Afghans by US and Nato soldiers is racism. This entry was posted in International News and tagged Kill teams in Afghanistan: the truth, The Kill Team, anti-American sentiment among ordinary Afghans, atrocities committed by American soldiers in Afghanistan. Bookmark the permalink.